After a successful conference showing last year at Game Show NYC (a games, education and art conference), I am thrilled to post that my game, Elephant in the Relationship, has been selected to be shown at a slightly edgier venue, Arse Elektronika 2012, running September 27 through September 30 in San Francisco. Initially conceived as a serious game in Tracy Fullerton’s Game Design Workshop class, the Elephant in the Relationship team (Andy Uehara, Casey China, Joshua McVeigh-Schultz and myself) has worked to sculpt the game over several iterations and various playtests. Elephant in the Relationship is a game for 2 to 4 players in which players try to communicate deeply troubling relationship issues. Players take on the roles of two people in a personal relationship and turn the drama of a potentially risky (or intimate) interaction into spectacle for a group to enjoy. The game fuses Pictionary-style drawing and guessing mechanics with elements of doll-play and improvisational theater, asking players to place themselves into a difficult emotional scenario with their partner. Having taken off almost a year in development (so Josh could get through his PhD qualifying exams and Andy and I could finish our Master’s degree theses), we’re revisiting the game for Arse Elektronika. The issues presented will be of a more sexual nature and the rule set will most likely be modified as well to look at the subject of the conference, “4PLAY: Gamifuckation and Its Discontents” (I said it was edgier). With a little more time on our hands now, the Elephant team is also hoping to polish the game for a future commercial release. Comic-Con is coming! Comic-Con is coming! 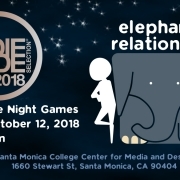 Presenting Elephant in the Relationship at IndieCade 2018 Night Games!